ExpoTV has formally launched "Kitchen Table Conversations," (KTC in my shorthand) a new research service in which certain members of its community provide video responses to a set of brand-sponsored research questions. The resulting video footage provides authentic, qualitative insights on actual consumers' habits, attitudes and behaviors. KTC is yet another example of "purpose-driven" user-generated video, a concept I began discussing in Fall '08 that continues to gain traction. I talked with Expo's president Bill Hildebolt yesterday to learn more about how the new research service works. For those not familiar with Expo, it is a community-oriented site where consumers create videos of themselves reviewing products they've used. The site now offers a catalog of 300,000+ of these "videopinions" on a wide diversity of products, generated by 60K+ community members. Over time Expo has evolved from being an outlet where users alone chose which products to review (which they can still do) to a model where sponsors are able to tap the community for video reviews of specific products. Members receive points in exchange for their video submissions and other activities. Bill explained that the KTC research service originated from sponsors approaching Expo with a desire to interact with community members on a deeper level. With KTC, the research sponsor (e.g. brand, ad agency, trade organization, etc.) can submit a series of questions and the respondent profiles they want to target. Expo then taps into its member database and offers invitations to participate. 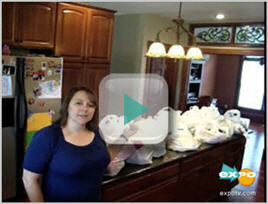 Because participants have a track record of submitting video to Expo, a minimum quality level is pretty well assured. As part of its service, Expo can edit the submitted videos into a package or just provide them raw to the research sponsor to use as they'd like. While online research is not a new concept (how many of us have filled out surveys or email questionnaires), what's different here is the reliance on video, which provides a different level of insight. Bill said that for researchers, KTC fits between traditional focus groups (where a group of individuals is brought together in a room to discuss their views of a product) and "ethnography" (a process whereby professional researchers actually live with participants for a period of time studying and capturing their behaviors). Bill believes that KTC provides many of the same authentic, on-location benefits of ethnography, but at a price comparable to focus groups and in a far-quicker turnaround time of 2 weeks or less. Expo has run half a dozen KTC research projects over the past 9-12 months, working to refine the process. The adjacent video, from one of the research projects (focusing on moms' grocery shopping habits), is a good example of an edited result. In it, you see and hear women in their own homes, speaking authentically and showing specifics (e.g. a coupon folder, handwritten lists, etc.) of how they do their shopping. The video won't be mistaken for prime-time entertainment, but to researchers looking for nuggets of insight, it's golden. For agencies in particular, which can incorporate select segments of KTC video into their client pitches, it's a totally new approach to consumer research. KTC is the latest example to hit my radar of how certain types of user-generated video can be used for very productive purposes. Regardless of what might be said about YouTube's and others' inability to monetize the user-generated video uploaded to their sites, one of the derivative benefits of all this user activity is that an army of amateur videographers has been created, many of whom are comfortable in front of and behind the camera. Their video won't win an Oscar or Emmy any time soon, but as Expo and others are proving, their skills and passion are valuable and can be tapped for various purposes.